The three–day spectacular international event will take place June 9-11. 2017 at the Meadowlands Expo Center, just outside New York City. We will have a vending booth all 3 days during the full show hours. 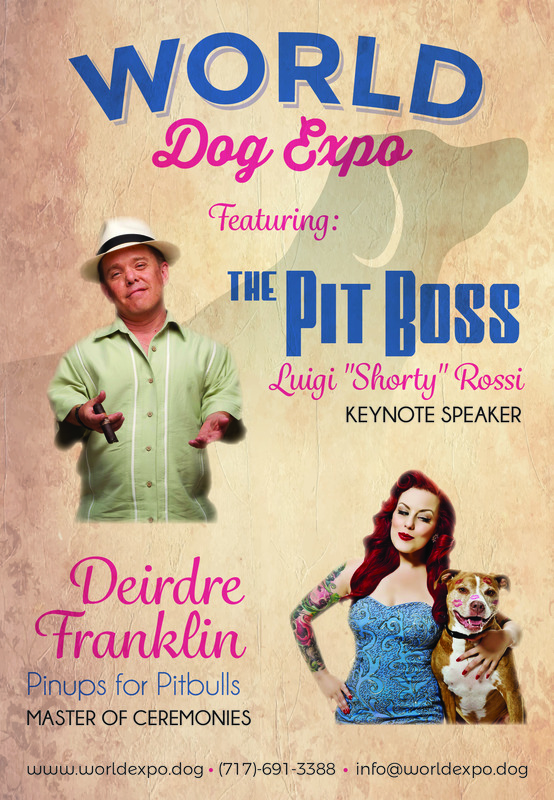 6/9 Deirdre ‘Little Darling’ Franklin will be hosting a rescue banquet at World Dog Expo on 6/9 with TV star of Pit Boss, Shorty Rossi. BSL – Community Safety through Breed Bans? This interactive discussion presents the scientific facts of why BSL (Breed Specific Legislation) does not make communities safer. Deirdre Franklin provides a strong case as to why the focus should be on individual dog owners rather than entire breeds or types of dogs. BSL is a hot topic that affects dog owners, non dog owners, dog trainers, and their clientele. This presentation will provide solutions for effective community safety through breed neutral recommendations. We’ve gathered the top experts in all fields relating to dogs to teach at World Dog Expo. There will be classroom seminars for more advanced education. For those looking for quick tips and tricks, there will be free onsite demonstrations.